Mira and her husband set out for adventures in Italy and France, discoveries of culture, romance, and adventure. First stop, Milan, fashion and design home that called her attention to novelty and visual extravagance. Women on the street dressed with no detail left to chance … including undergarments when tastefully visible. She appreciated the care and artistry. Why not let that summer white blouse complement the bra beneath? And the window treatments of high fashion stores were a notch above anything previously experienced - artistry in service of contemporary whim, and even mockery. Venice canal bridges and meandering pedestrian paths were the perfect warmup for Mira and her walking companion as they spent some days eye feasting on the watery light prior to Dolomite hiking. So enthralled by outdoor visual richness at every turn and time of day, they simply chose to walk and eat, beginning near sunrise to enjoy the cool quiet, rarely associated with this town. Dolomite mountains called her to hike, especially after experiencing the Tasmanian dolomites, and these ones were a challenge and a gift. Her friend, Caroline, from university, a few decades back, was her willing partner and they were a good match for the task. Plenty to share and discuss, a lifetime of interests kept their minds active. Full days, exhausted nights, directional mistakes, recovery, ups and downs of mountain journeying forged a new friendship bond. Caroline’s photographic interest and ability added another layer of depth for Mira as she saw how an expert looks through the lens. Some of her photos are used in the banners, the outstanding ones. Thank you Caroline! After a successful closed loop brought the hikers back to their starting town, they set off to meander the undulating vineyards of Prosecco territory fully anticipating many celebratory raised glasses … and they were not disappointed. Early fall foliage color and harvest ready fruit was ripe for photographic picking. The back roads empty of tourists carried small motor carts of grape tailings. Will this end up as balsamic vinegar she wonders. In the town of Ravenna, home of meta collage, where for centuries the art of taking colored shards configured into pictorial splendor intrigues viewers with sparkling intense hues. And for Mira, the delight of reconfiguring these gems electronically through digital erasure of extraneous parts was a joyful enterprise in its own right. What is this about? Subtracting the negative space as a way of creating an image is age old and for good reason. Like sculpting, removing material accomplishes the compositional task. 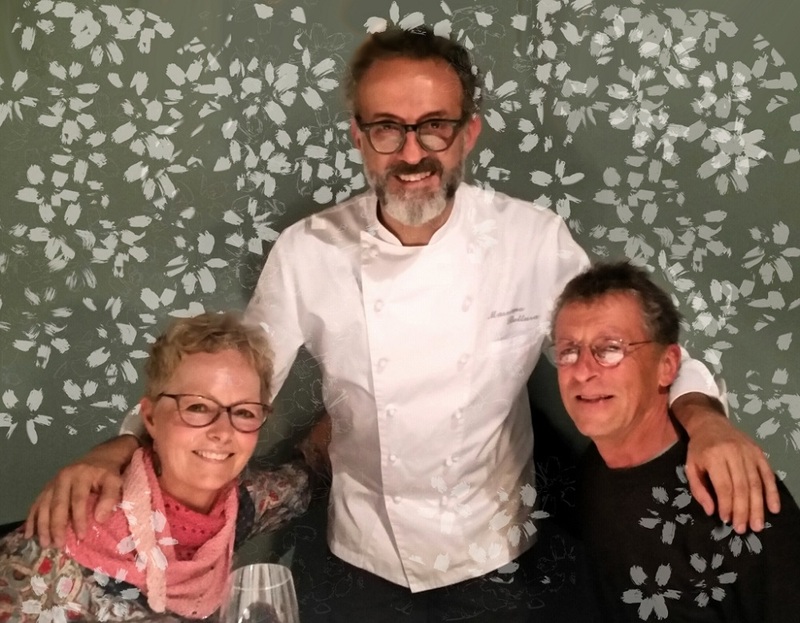 Mira met her husband who had been biking in France and they headed to Modena for the dinner of their lives with Massimo Bottura of Osteria Francescana. In celebration of an important birthday they decided months prior to dine with this artist chef and it was truly beyond their wildest imaginings. Dinner was a four hour multi-sensory culinary extravaganza. Traveling with a Roman and Renaissance art and architecture expert meant many days in Rome exploring ruins, basilicas, museums. To keep her sanity, Mira chose to focus on her particular favorite Italian artist, the very bad boy, Caravaggio, spending her spare time reading about his life and work of which there is more speculation than fact and in reality the paintings themselves tell most of the story of his short violent life. The darkness of that story and the power plays in the name of God and church had such a resonance with the ugliness of today's political realities that she found it uncanny and dizzying at times. Mira heard it said that everything good in Italy is better in Sicily, and in the case of food she experienced this as truth. The ripest reddest tomatoes, huge purple cauliflower and fennel, large eyed silvery eels, overstuffed cannoli, market sandwiches big enough to feed a sizeable family, were some of the goodies she enjoyed seeing or eating. On an eat, pray, love scale eating seems the clear preference, or maybe she should say, the love of eating. Oh, and then there was the counterfeit 50 E note that somehow seems fitting for the place. Rome, layered in history, stratified with antiquities, is comfortable mixing periods and this Mira found exhilarating. A Jean Arp art retrospective displayed in ancient Diocletian Baths with original mosaics on the floor felt fresh. William Kentridge's dissolving mural stenciled along the Tiber River depicting scenes from Roman history filtered through his eyes was exciting to view, yet undisturbing to its surroundings. Created by power washing the white areas, it is designed to darken with the dirt of time ... a natural way for art and other things to fade she thinks. Is this some sort of metaphor for all human ages being present at the same time - the reason she feels younger as she becomes more chronologically gifted?